New pictures of a new Dell Latitude Z Series laptop have surfaced on the internet, promising a thinner design and lower power consumption. The leak comprises almost solely of pictures of the ultra-thin laptop, although another poster on the forum which outed the pics has claimed that it will be sporting a 15-inch matte screen, Core 2 Due processor and a webcam that can detect which face is looking at it. The same tipster also believes that the new laptop will be debuting next week, and if the pictures are anything to go by, it looks like the finished product with Windows Vista and Intel Centrino stickers. There's an odd Ethernet port around the back, and the rest of the ports have been reduced in size as well, so the whole ultra-thin theory looks like a goer, although not into Apple Macbook Air territory. As it's not rocking Intel's Atom processor, it's hard to tell how low-power this laptop is going to be, but early indications hint that it will be rather kind on the juice, meaning more work hours on the train when you forget your power lead. 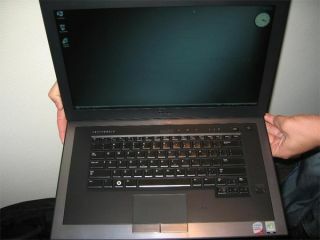 We'll be bringing you news of the release should this new thin laptop appear on the market, so stay tuned.